Remember when I told you a little about me? Well today I thought I would conquer one of my biggest irrational fears and keep it real. Last week my house was a well oiled machine. A clean machine that is, I was so proud! But the busy weekend comes with all the fun and busy things to do. 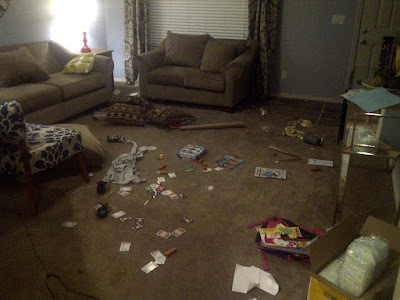 And well, I ended up exhausted and going up to bed last night with my living room looking like this. I guess in the end I'm okay with that. These messes won't last forever. And someday there will be no joy that comes from throwing pillows on the floor and playing the same board game for 48 hours. So today if you stop by you will find me in my Boise State sweats cleaning and hopefully folding a little laundry. And that will be in between giving lots of kisses, filling sippys, dragon training, a few books and getting to that bus stop on time. It was a great weekend. Thanks to those who have helped so far with the paint project. Everything seems to be coming together for Saturday.